So coming from arguably my favorite rap duo in history (and this says a lot considering the duo's that are out there ie. Gang Starr, Outkast, Pete Rock & C.L. Smooth, M.O.P...) arrives the 6th CD from People Under The Stairs. This group, based out of L.A., consists of two rappers Thes One & Double K. What I love about these guys is that they do everything themselves and the result is phenomenal. Also, they have such a laid back style, rhyme about what they love (making beats, video games, friends, food, etc. ), and have some of the most well-crafted beats I've ever heard. 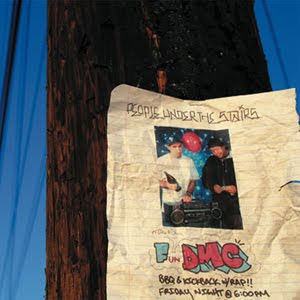 Even by the title of this album, Fun DMC, you can tell that this group is out to have fun with their music and pay homage to the old school. I don't say this very often about new hip hop records, but this album is an instant classic and should not be overlooked. These guys released a video for one of their singles called The Wiz about how much they love Australia. Check it out and tell me that it's not the definition of chill.